Schiphol, The Netherlands, 2017-Apr-19 — /Travel PR News/ — The upcoming Easter weekend signals the kick-off of the holiday season at Amsterdam Airport Schiphol. The holiday season brings with it a peak in passenger numbers that will not decrease until well into October. Based on current projections, there will be more than hundred peak days of more than 200.000 passengers a day in the months to come. Schiphol is making every effort to ensure that each passenger’s journey goes smoothly. 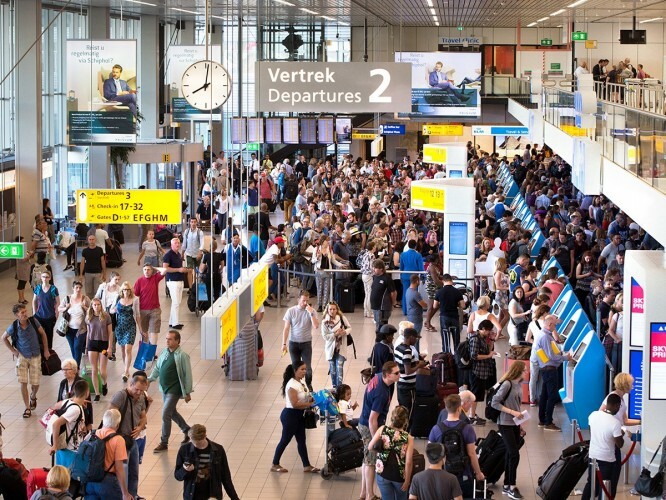 Schiphol will be deploying additional staff during peak periods, e.g. for security checks, in the terminals or on the parking lots. In addition, the recently opened temporary departure hall is now fully operational, providing the capacity to process more passengers. Safety is paramount at Schiphol. Despite all additional efforts to get them to their planes as quickly and smoothly as possible, passengers may still face a longer waiting period. Certain security checks must be carried out to ensure the safety of all parties, after all, and those take some time. This entry was posted in Airports, Business, Holidays, Travel, Travel Management, Travel Safety, Travelers and tagged Easter Weekend, Holiday Seasons, Miriam Hoekstra-Van der Deen, Schipol. Bookmark the permalink.